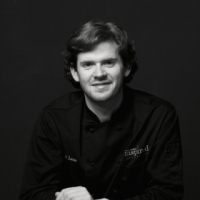 A graduate of Kansas State University in Hotel and Restaurant Management, Stewart is a seasoned pro in the world of off-premise catering. He served in the kitchen, in the field, and behind the scenes producing events both locally and throughout the United States. Stewart studied abroad at the Apicius Culinary Center in Florence, Italy during the 2006 fall semester, where he studied Italian cuisine, breads, and regional wines. In 2008, he traveled to Beijing, China to take his role as Supervisory Chef for the USA House where he oversaw 30 chefs from around the country. He has worked in the family catering business since he was five years old. He has been the company's head Research and Development Chef since 2012 and writes a blog, Culinary R and D, chronicling all of their new and exciting creations.